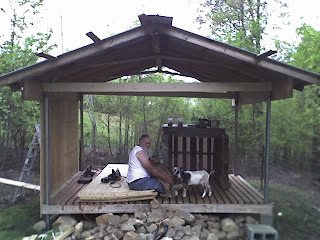 John and I got busy this weekend working on the lower barn. This barn will be a cozy home for all our boys. 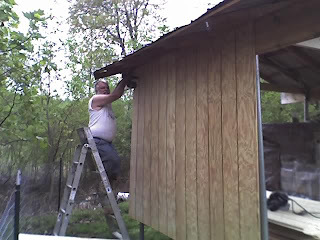 Here we see John attaching the last panel on one of the sides. 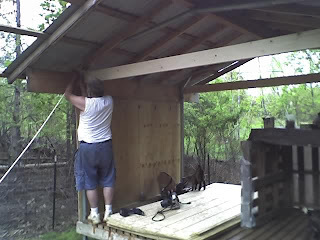 We had to connect the rope and pull a bit to get the structure square. One whole side done and Ginger approves. We took a break at this point and went in to have a little Sunday dinner. John grilled up some T-bone steaks, while cooked up some squash and put together a salad. We had baby greens, cranberries, pecans and goat cheese with a Rasberry Walnut dressing.